Dec 2011: Inclusion comes from Awareness, Acceptance and Sensitization. We continue to encourage Students to think BEYOND DISABILITIES.... 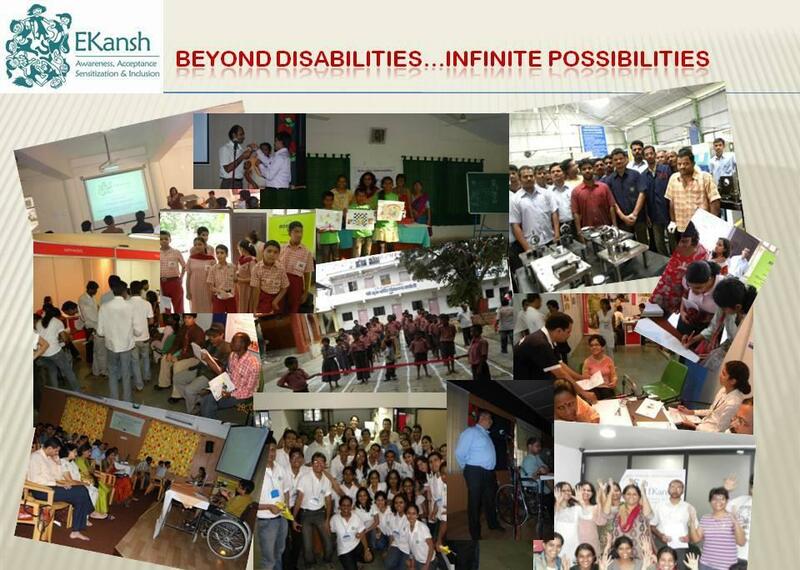 The theme for the Film Making Contest at LaissezFaire2011 - Beyond Disabilities, Infinite Possibilities - at Symbiosis was suggested and sponsored by EKansh Trust. *1200 calendars on Awareness about Early Intervention to distribute among health workers in rural and urban slum areas ....the process begins in earnest. * 2rd December: Campaign in colleges and schools in Pune..also in organizations by volunteers. *Silent Eloquence III: 13/14 August, Pune. Introduction to basic Indian Sign Language. *8 July 2011 Managing Trustee and Founder of EKansh, Anita Narayan Iyer was invited by NASSCOM to speak at their Diversity and Inclusion Conference. *March/April 2011: EKansh collaborates with Bajaj Allianz, Pune, in their effort to Include Visually Impaired candidates in their workforce. We conducted an Access Audit of their Pune Office and recommended necessary modifications. *11 March 2011: Our first training program at Pune University for Visually Impaired candidates in Personality Development and Employability Skills. *12th February 2011: Meeting with NGOs and Candidates alongwith Corporate Trainers organized by EKansh at BKS. Assessment of employability skills of candidates. * 8 January: Meeting at Bal Kalyan Sanstha with heads of various NGOs and institutes for PwD alongwith Corporate Trainers organized by EKansh and BKS to discuss training programs for candidates with disabilities. *11 January: Ekansh Founder and Managing Trustee Anita Narayan Iyer was invited as Chief Guest at the annual day celebrations at Suhrud Mandal, Pune. EKansh Members Ramona Parsani and Girish Sharangpani also attended the event. 2011: We began the year with THANKS to all our supporters. IIT Roorkee: 27th March 2010:EKansh Interactive session with students of Architecture on the Importance of Universal (Barrier-free) Design at IIT-R's COGNIZANCE. Park for the disabled: EKansh voluntarily submitted formal detailed suggestions to Raheja Constructions for modification of the park opposite Ruby Hall to make it disabled friendly. Changes began right away and are on in full swing for wheelchair-able pathways and possibly a ' touch and smell' section for the Visually Impaired. Hopefully the rest will follow. August 2009: Our seminar on Accessibility and Inclusion which was the conclusion of a competition on BARRIER FREE DESIGN AND ARCHITECTURE in Pune. The first day was the prize giving ceremony and discussions and talks on Barrier Free Design. The second day saw activists and experts on different disabilities speak on the need for Inclusion. This was a landmark event in Pune. 25/02/2010: Interactive session on Disabilities and Human Dignity for students of Philosophy at JDV Institute, Pune. * IIT Roorkee: 27th March 2010:EKansh Interactive session with students of Architecture on the Importance of Universal (Barrier-free) Design at IIT-R's COGNIZANCE. * Lecture at JDV, Pune on Human Dignity and Disabilities. *Silent Eloquence: I – Introduction to Indian Sign Language and the issues of the Hearing Impaired. Basic ISL conversation and applications of ISL. * Weekend ISL workshop under the Avanti Banner at Clover Centre in 2007.